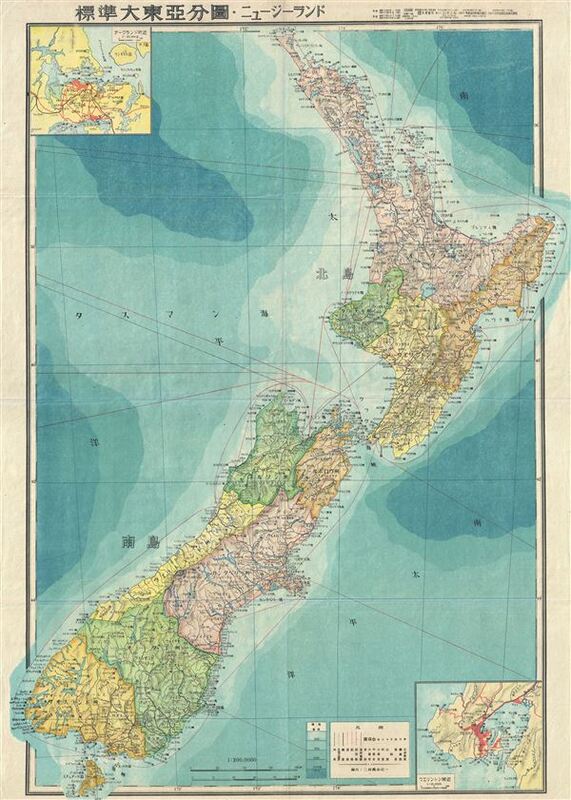 This is a stunning large format Japanese map of New Zealand dating to World War II, and one of the most beautiful cartographic depictions of New Zealand to appear in the 20th century. It covers the entirety of New Zealand, including North Island and South Island with insets of important harbors in the upper left and lower right quadrants. The map offers superb detail regarding both topographical and political elements, noting cities and roads as well as air and sea routes. Blue shading is used to indicate oceanic depths. All text is in Japanese. This map was created by the Japanese during World War II as part of a series of folding maps of parts of Asia and Pacific and is possibly suggestive of Japanese imperial ambitions for this region. This map is no. 17 in that series.